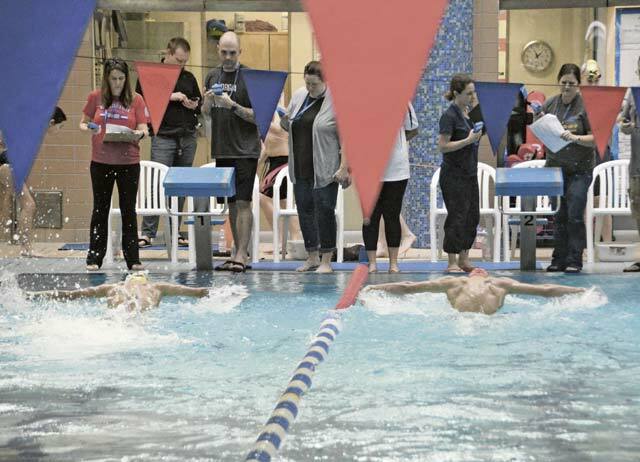 It was senior recognition day for the Kaiserslautern Kingfish and they said goodbye to their senior captain with a dominant performance in their multi-team swimming meet at the Ramstein pool Saturday. Several Kingfishers won their events, outdistancing second place Stuttgart, but it was again the Pierrelouis siblings who made the biggest splash. Connor Mulrooney, a senior honors student at Kaiserslautern High School, was recognized for his four years of hard work and leadership with the Kingfish. Mulrooney finished second in the 17 to 19-year-old 100 butterfly and the 400 freestyle in the last home meet in his career. Emily Stuart solidified her hold on the number one EFSL 17-19 rankings in the 100-meter breaststroke with a convincing victory. She added a first place ribbon in the 200 freestyle. Teammate Jacob Golden is the top-ranked 400 freestyle swimmer in the age group. He is also ranked second in the ESFL in 200 freestyle and fourth in the 100 free. They will be favored to win their events at the Divisional races on Sunday. Noah Lang was the class winner in the 100 free. However, the hottest swimmers heading into the tournament may be the Pierrelouis siblings. Ten-year-old Leon again set EFSL records with his 34.36 in the 50-meter butterfly and in the 200 individual medley with a time of 2:53:44, which was six seconds faster than his previous time in that event. He also won the 50-meter breaststroke. His 50 freestyle was sub 30 seconds, which is tops in his age group. He also set records at the Kingfish’s last meet two weeks ago. Every time he enters the pool a record could fall. Big sister Alexis, competing in the 15 to 16-year-old division, set a new record with a 29.04 in the 50-meter butterfly, two seconds faster than her previous best. She also won the 100-meter butterfly and the 100-meter backstroke. She enters this week’s Divisionals as the top-rated swimmer in the 50 freestyle and the 100 butterfly. She was joined in the 15-16 division’s winner’s circle by Ryan Kirby with wins in the 200 individual medley and 200 freestyle, Chloe Culbertson’s first in the 100 breaststroke, John Tittel’s victory in the 100-meter butterfly and Owen Dube’s titles in the 100-meter backstroke and the 100-meter freestyle. The high school-aged swimmers can qualify for a varsity letter if they meet the criteria. The Kingfish are strong in the upper grades, but are poised to be even stronger in the years to come. Their most dominant age group is the 13 to 14 group and their top competition is against each other. The closest race was between teammates Annabelle McFarland and Annika Zimmerer in the 100-meter breaststroke. McFarland edged Zimmerer by .14 seconds, touching the rail virtually at the same time. McFarland is ranked second in that event while Zimmerer won the 100 butterfly and the 100 backstroke, the event at which she is ranked number one in the division. Ten Kingfish finished first or second in the day’s events in that age group, three of whom are ranked in the ESFL standings. In the 11 to 12-year-old group, Megan Stuart is ranked in the ESFL in six of the eight events in which she participates. Victor Osadsky, Tyler Jones and Andre Rendon are all ranked in the ESFL. Rylie Horner trimmed four seconds off of her previous best, which is very difficult to do. Tyler Jones qualified in the 200 individual medley. It was the first time he had ever participated in that event. Marcus Kennedy, swimming in the eight and under group, had never swum the IM before Saturday. But his performance was so stellar that he is now the fifth-rated swimmer in that event in his age group. He also won his 50 backstroke race. The divisional meet will be held Sunday. It is last team event before the championship meet at Eindhoven, the Netherlands, on the first weekend in March.